Middle-earth coinage from the realms of Moria, Hollin, Mordor, Rohan, and Old Dale. 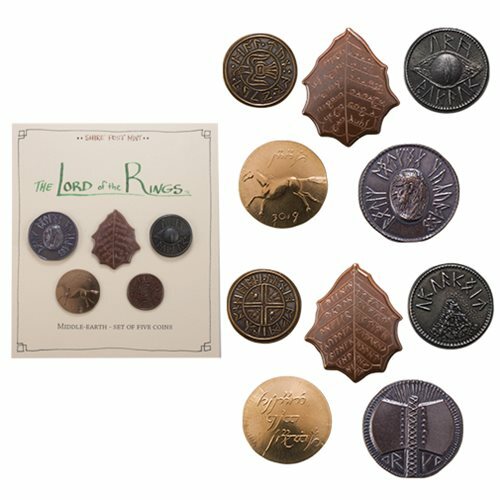 This set includes an Axe of Durin in copper, Fall Leaf of Holly in copper, Eye of Sauron in iron, Brumby Penny in bronze, and Raven Penny in copper. The text is inscribed in runes and Tengwar. Coins are made one at a time in the USA using antique machinery and traditional coining techniques. Each set includes a sheet with history and translations. Officially licensed merchandise. Ages 15 and up.